Falmouth May 3, 2014 - First Event of the Season!!! Our season kicks off Saturday May 3rd (tomorrow) at Falmouth, KY! Come out to the Pendleton Co Fairgrounds to see Work Stock Diesel Trucks, Pro Street Diesel Trucks, Light Limited Super Stock Tractors, Super Stock 2WD Trucks, Pro Farm Tractors and Hot Farm Tractors. This is not pull order. Pull starts at 7pm EDT. For Pull Order, Updates, Winner Circle Pics, and More, like us on Facebook at facebook.com/BluegrassPulling (click here). 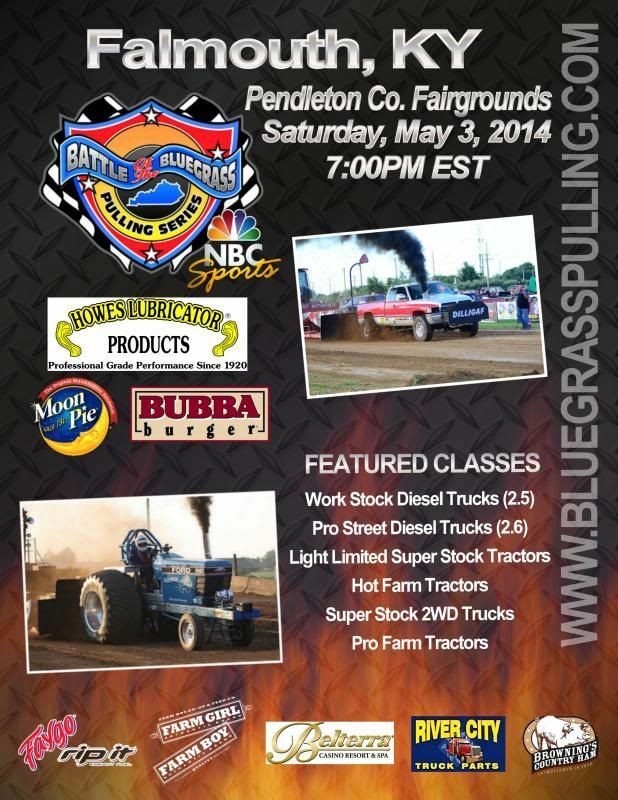 For rules, series info, season schedule, amd more, check out our Website at bluegrasspulling.com (click here).